Wecooker 4-Burner Propane Gas Grill collection Main 4 burners 60,000 BTUs Porcelain coated warming rack, Rolling casters with locking function,complete with a 12,000 BTU side burner, powder-coated steel side shelves, rolling casters with locking function and electric ignition. Cooking for a crowd is easy with this grill's 28-burger capacity. The porcelain-coated warming rack keeps your food warm while the party goes on. With a black top and stainless steel finish, this grill fits in perfectly with any patio and is sure to bring complements from neighbors and friends. Assembly is required. JX BBQ Factory has area of 50000 square meters, expert in Outdoor BBQ Grill, Grill Rotisserie Kit, Customized Metal Parts production over 15 years, production equipment and process from raw material cutting, stamping, deep-drawing, bending, welding, polishing, powder coating & painting, assembly, inspecting, packing, until loading container. All process with advanced machines, superior workers and standard quality control to make high quality products for customers! Control panel: SS#430 & Black color stamped steel. Side shelves: Black color coated stamped steel. Cart construction: Black color coated stamped steel. Overall Size: 55.3"(L) x 25.4[(W) x 47.7[(H). Carton Size : 30.71"(L) x 26.77[(W) x 26.18[(H). Looking for ideal Propane Gas BBQ Manufacturer & supplier ? We have a wide selection at great prices to help you get creative. All the Customized BBQ Grill LPG are quality guaranteed. 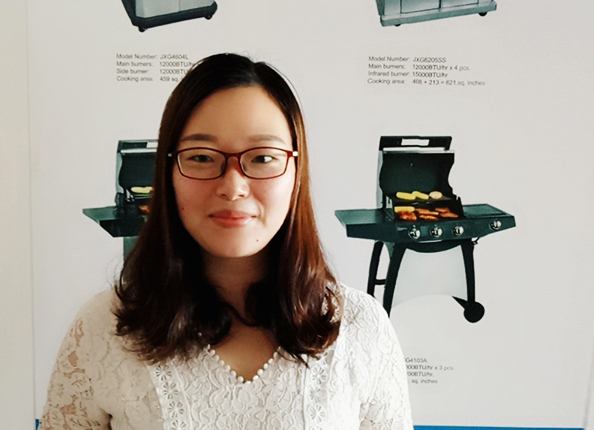 We are China Origin Factory of Outdoor Camping Gas Braai. If you have any question, please feel free to contact us.